After doing our surface interval and discussing our dive plan to head north and stay within 30 feet of the surface, Jason and I headed back down the steps at Maeda Point to get in the water. Our second dive proved to be even better than the first. 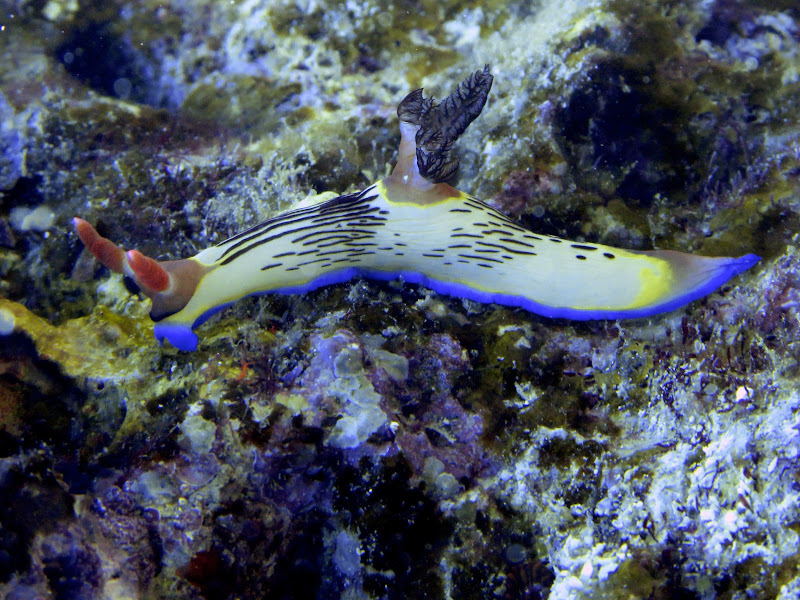 We saw two nudibranchs neither of us had before (so exciting! 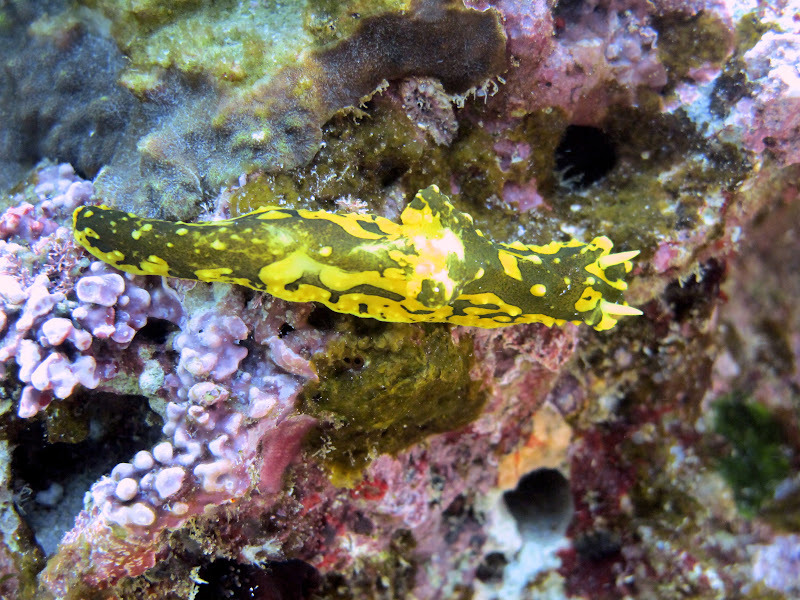 ), an eel, and another tasseled scorpionfish. Jason and I decided that he would lead the dive – he knew where the Maeda Point cave was located. We swam through a maze of coral and rock outcroppings until we reached the cave. Neither of us had much interest of going inside so we turned around to explore the area we had previously covered. 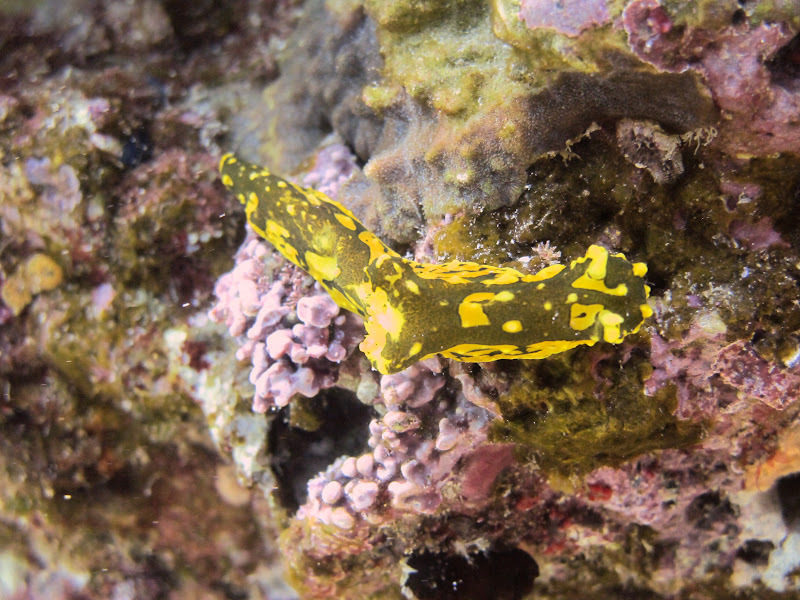 As I followed Jason through the rocks, he pointed out a black and yellow nudibranch crawling on a ledge…one I had never seen before. Awesome! We both nabbed a few photos of it. It was crawling pretty fast and it soon disappeared into a a crevice. 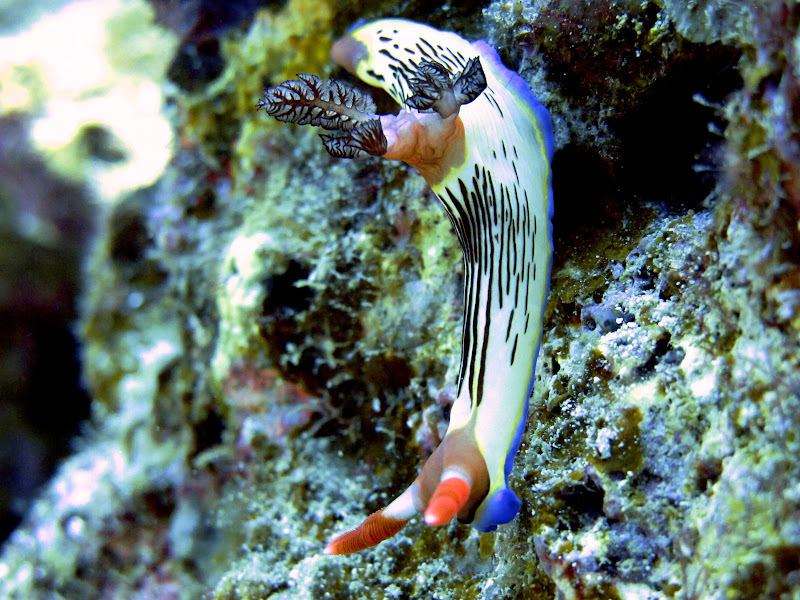 After returning home I went online to see if I could find out this nudibranch I knew nothing about. Turn out its name is Aegires gardineri. 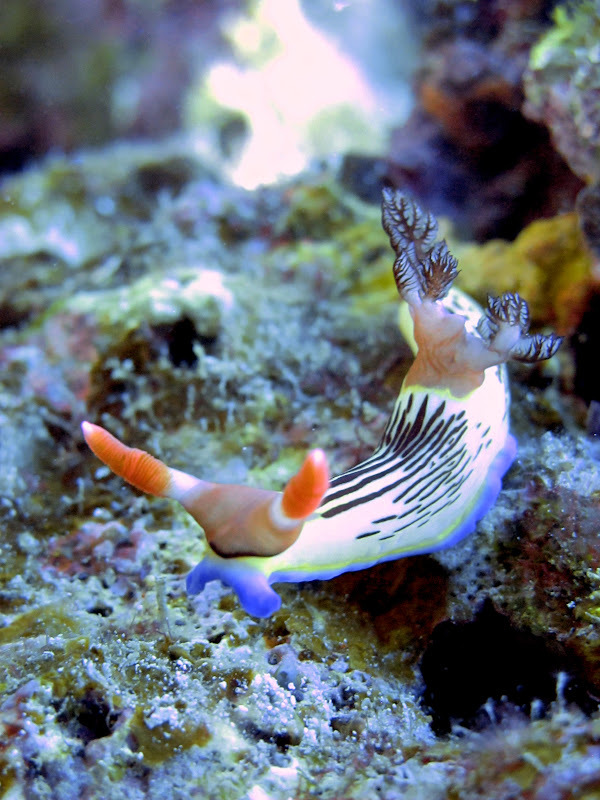 According to Robert Bolland’s website, The Okinawa Slug Site, this type of nudibranch is uncommon in Okinawa. Besides that, I didn’t find much else about it. 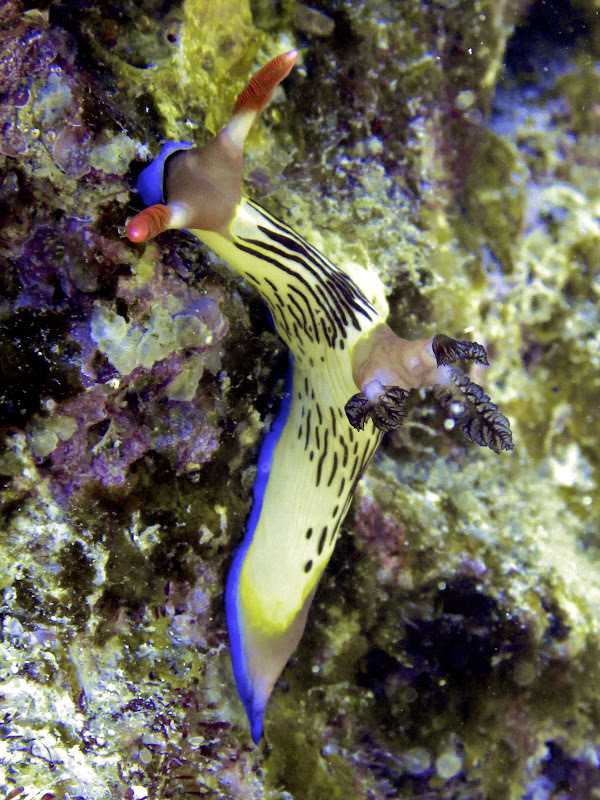 Soon after we moved on from looking at the Aegires gardineri nudibranch Jason once again came through with a good spotting. 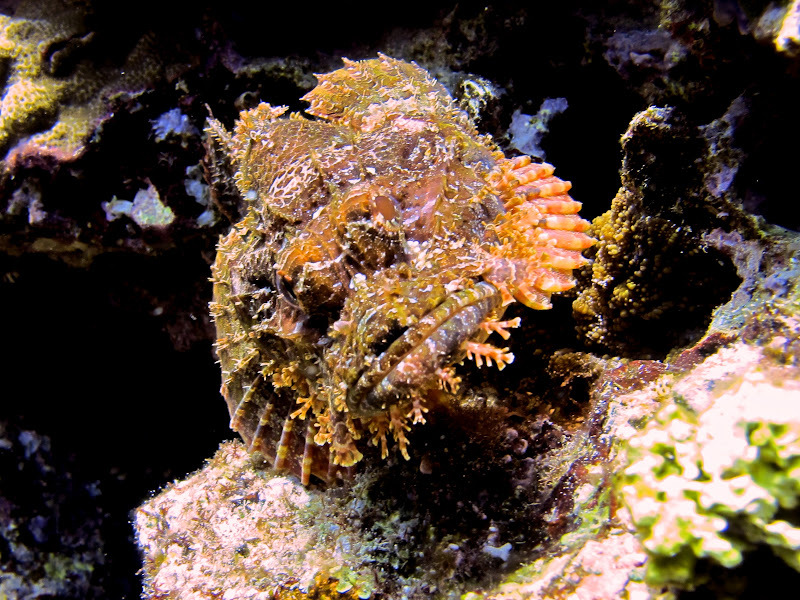 This time is was a tasseled scorpionfish. I slowly approached and snapped a pretty good head-on photo. 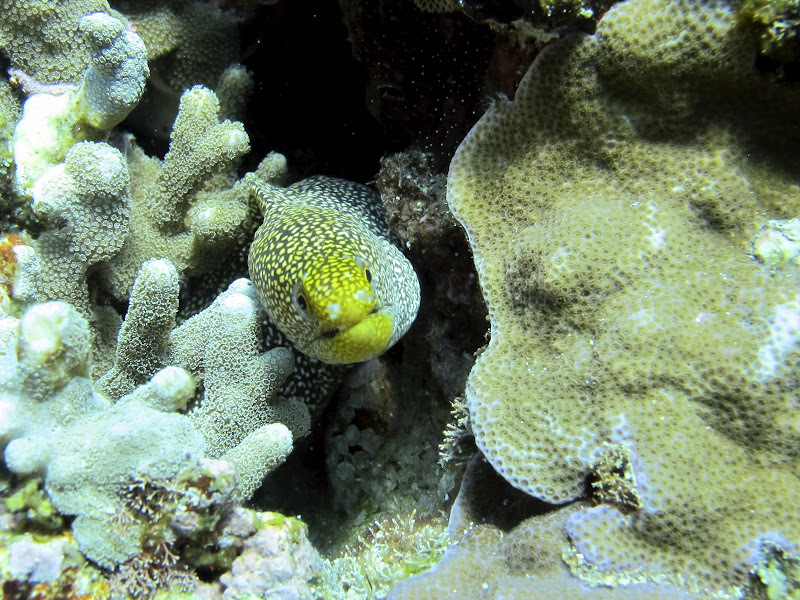 Not one minute after seeing the tasseled scorpionfish, we spotted an eel sticking it’s head out of some coral. Jason hovered above the rocks and took some photos. When he finished, I moved and got a few; however, I think I got a little too close for comfort an the eel retreated back into the crevice. Undeterred, I swam around to the backside of the coral to see if his head would pop out there. My instincts were correct and I managed to get a few more photos. As of right now, I haven’t been able to identify this type of eel. If you have any idea, please let me know!Anyone know what type of eel this is? 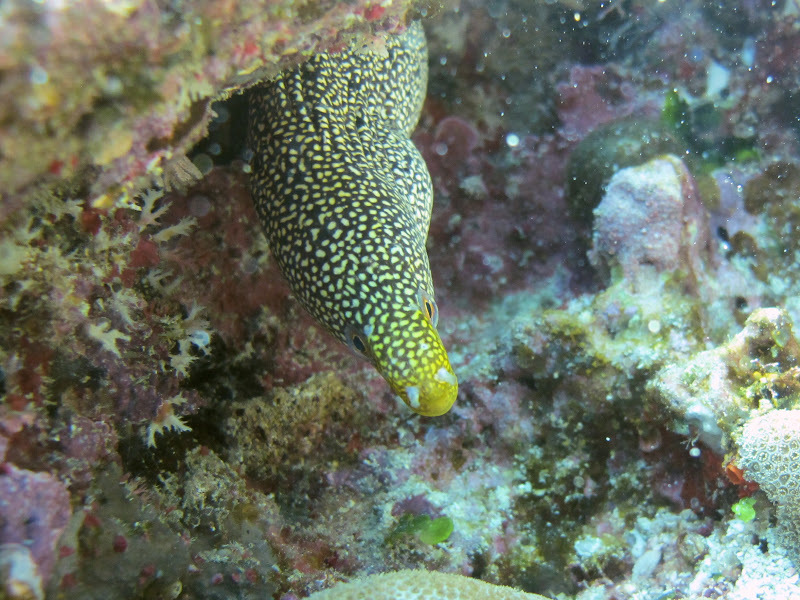 Undeterred by the fact that the eel disappeared, I swam around to the backside of the coral to see if his head would pop out there. My instincts were correct and I managed to get a few more photos. Unfortunately, the eel positioned itself under a ledge and it wasn’t ideal for taking pictures. I tried taking a few pictures but wasn’t able to angle my camera as I had wanted so I stopped and just enjoyed watching the eel. As of right now, I haven’t been able to identify this type of eel. If you have any idea, please let me know! As Jason and I started kicking back to the exit point, Jason noticed another nudibranch crawling on the rocks below us. Wow! 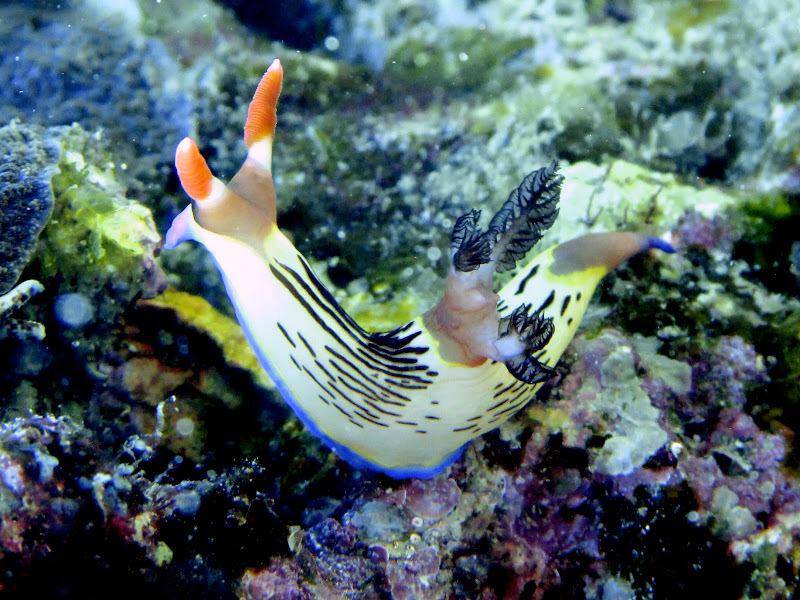 It was another type of nudibranch I’d never seen before. This was turning out to be a great dive! Jason swooped down and started taking pictures. I kept my distance but used the zoom on my camera to get some photos while waiting. 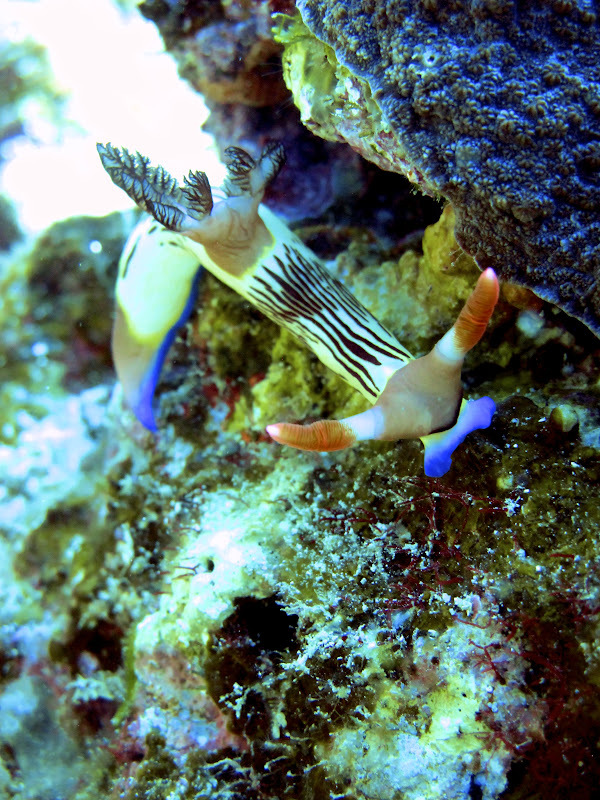 Surprisingly, they turned out pretty good even though I was at least 6-9 feet away from the 2 inch nudibranch. While Jason practiced using his new camera and adjusting it’s various settings, I waited patiently and just enjoyed watching the nudibranch crawl along the rocks. Sometimes I get so wrapped up in using my camera, I forget to sit back, relax, and take it all in. Once Jason had finished, I got in close with my camera and went crazy on the shutter. Photographing this nudibranch was a lot of fun. It had bright colors and a cute “face.” Perfect subject matter, right?! After I had snapped away to my hearts content, Jason and I kicked back to the exit, made our safety stop, and then exited. We were both excited about the two new nudibranchs we’d seen and I was eager to find out their names. I don’t make my way up north very often anymore but after the two dives I’ve done today, I will be looking to go back here soon!